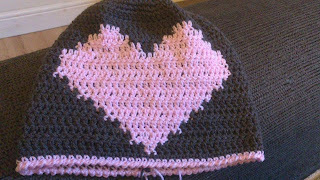 Well, following on from last week's post, I am pleased to say that I have finally figured out how to get a lovely heart shaped motif onto the front of a baby beanie. The problem is, I made the beanie slightly out of proportion. It fits my 2 year old's head perfectly around the circumference but it a little too long. It has ended up looking more like a "slouchy" beanie than a well fitting one, and that messes with the heart motif slightly. But the hardest part is now over. I have figured out the hook size and number of stitches needed to get the right circumference and the basic heart shape is complete. Now all I have to do is adjust it slightly to fit into less rows to make sure the hat is the right size. Honestly, if you had seen my frustration this week when trying to get the heart shape just right you'd have had a little chuckle! I tried visualising it my head, I then put it down on squared paper and it all looked right, but then I discovered that I had made a silly error... the stitch I was using is longer than it is wide and so a perfect heart shape on squared paper was becoming distorted in the actual hat. I made several attempts before I figured that one out! Thankfully, my trusty "crochet guru" came to my rescue and suggested I use an excel spreadsheet to create a pattern where the length of the squares reflected the length of the stitches. And it worked a treat. So hopefully this week I shall have chance to perfect the design and get the pattern tested and turned into a PDF download. Then you can all start having a go yourselves. And if you can't crochet, don't worry there will be some of these hats in the auction next May as I will make a few more to test the pattern!